The Old Stone House is the oldest stone dwelling in Monongalia County. Records and family legends suggest the house was built circa 1795 by Jacob Nuze. 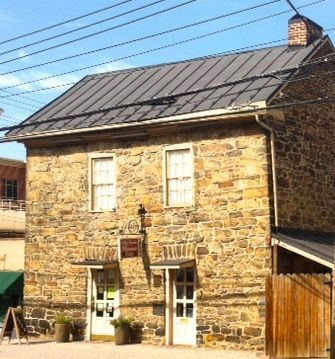 Historically, the sandstone building had many owners and occupants: Henry Dering, Jr. (1796); Jacob Foulk & John Wood Thompson, potters (1807); Joseph Shackelford, a tanner and lay minister (1813); George Baker & Frank Cox rented the house, beginning 1895, for a tailor shop, a taxi firm, and a used clothing store. The house was the site of the first Methodist Protestant Church in Monongalia County in 1830. From 1935 to 1976 the Service League of Morgantown rented the house for its headquarters and shops. In 1976, to recognize the organization’s community service and the U.S. bicentennial, the Cox family deeded the property to the League. The Old Stone House entered into the National Register of Historic Sites in 1972, and was dedicated as a United Methodist Church Historic Site in 1990. In 1995 the Old Stone House Preservation Fund was established from community donations to maintain this historic property. In 2004 the House was included in MainStreet Morgantown’s historic walking tour.